runs from geology to the really weird bits of physics. I have never yet found a popular science writer, however good, who can make geology truly interesting, while something like quantum physics is so fascinating (and strange) that it takes little effort to make it fascinating (though it’s hard to make it comprehensible). Materials science – what I call ‘how stuff works’ when talking to junior school children generally sits near to geology on that spectrum. 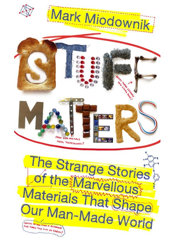 But Mark Miodownik has managed the near-impossible and made it a deeply enjoyable read. I thought things were going to be a bit dire when he starts with the story of how he was attacked as a teen with a razor blade on the London Underground and developed a fascination with the nature of metal, an opinion that wasn’t helped by the rather self-indulgent approach of basing the book around a photograph of the author sitting on his roof terrace. But very soon the superb storytelling took over and we were into the fascinating world of Bessemer and the making of steel. In fact so well are the stories told throughout the book that the author’s photograph of himself becomes an old friend and interesting as a focus. It really works. The book has ten sections, covering metals, paper, concrete, chocolate, foam (particularly aerogel), plastic, glass, graphite, porcelain and rather bizarrely ‘implant’ covering both bones and artificial items in the body like screws. These are all delightful excursions into the subjects with plenty of diversions along the way. Two of the sections, paper and plastic, are weaker than the other because Miodownik decided to try a different format for the chapter. Paper has very little content (which is perhaps why he used this approach), consisting primarily of two page spreads describing different types of paper which gets a little repetitive. Plastic is done in the form of a film script (to reflect the importance of plastic film to moving pictures), but this seemed rather strained. Miodownik is also loose with the facts in stating that ‘the biggest diamond yet discovered… is an entire planet five times the Earth.’ That’s not science. All we know is that a star’s variation suggests a companion that has the right sort of density to possibly be mostly diamond. However these blips don’t damage the book’s integrity. Overall a delightful book on a subject that is relatively rarely written about – you could say the cinderella of the sciences. You will discover facts you didn’t know, how basic but important elements of our lives like cement or chocolate work at the structural level – and along the way will enjoy some excellent storytelling. Recommended.